Word Block is a strategic word game for 2-4 players that’s kind of like turn-based Boggle. Place letter cards in a grid. Mark cards with your block pieces. Score points by claiming words that start at your blocks. Other players also get points if your word uses cards that are marked with their blocks. Playing area large enough for laying out a grid of cards at least 4x4. You can use any set of letter cards or letter tiles. It doesn’t matter that much what the letter distribution is, but it’s helpful if about a third of the cards are vowels. Use 28 cards for 2 players, 40 cards for 3 or 4 players. The cards should have point values on them. It doesn’t matter that much what the point values are. The letters in the word “asteroid” are worth 1 point. The letters “jqxz” are worth 8 points. Other letters are worth 4 points. For a 2-player game, reduce the standard deck to 28 cards by randomly removing 12 of the 20 cards that have a red number. The red color is only for preparing the deck. It has no other purpose in the game. Choose a dictionary for resolving challenges. Draw cards to see who goes first. Closest to “z” wins. Each player chooses a set of 3 blocks and puts the blocks in their reserve. Shuffle the cards and deal each player a hand of 2 cards. Deal 4 cards face up in a 2x2 grid in the middle of the playing area. Put the rest of the cards face down in the draw pile. Draw a card if the draw pile still has cards. Choose any card from your hand and put it on an empty space in the playing area. The card must be placed adjacent to another card, in a grid pattern. The card must fit in the playing area. If there isn’t room in the playing area, you can replace any card that doesn’t have a block on it. The replaced card is discarded. Announce a word that starts from one of your blocks. Record the word on the scorepad. Give everyone points for the word (see below). Discard the blocked cards in the word, and return those blocks to each player’s reserve. Take any of your blocks and place it on any card in the grid that doesn’t already have a block. You can move a block that’s already on the grid. A card cannot have more than one block. Find a word at least 3 letters long that starts at one of your blocks and continues onto adjacent cards. Changing and reversing directions is ok. Repeating a card is ok. Note: This is different from Boggle. Using cards with other blocks is ok. 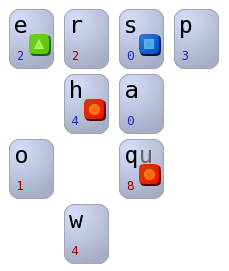 In the diagram, Blue Square can claim the words “she”, “sheer”, “share”, “sharer”, “sash”, “show”, and “shoo”. Blue Square can’t claim “saw”, because “a” is not adjacent to “w”. Blue Square can’t claim “shows”, because “w” is not adjacent to “s”. Blue Square can’t claim “shoe”, because there’s a gap between “o” and “e”. Blue Square can’t claim “rash”, because there isn’t a Square block on “r”. The “q” card is special because it has an optional “u”. In the diagram, Red Circle can claim “quash”. If someone adds a “t” next to the “a”, then Red Circle can claim “qat”. You can’t claim a word that has already been claimed in the game by any player. If you’re playing a series of games, you can’t claim any words that have already been used in the series. If you try to claim a repeat word, you don’t get a second chance this turn, but there’s no other penalty. Every player that has a block on the word will receive word points for the word, as well as card points for the cards with their blocks. Multiply the number of letters in the word by the number of cards used. Point values on the cards do not affect word points. 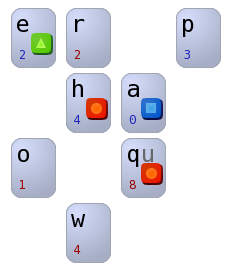 In the diagram, the word “sharers” is 7 letters times 5 cards = 35 word points. If you use the optional “u” on the “q” card, the “u” is included in the letter count. Card points are the values marked on the card. Add word points to every player who has a block on the word. More than one block does not give additional word points. 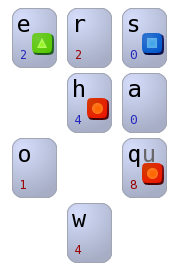 In the diagram, the word “quash” gives 5*4=20 word points to both Red Circle and Blue Square. For each block on the word, add the card’s points to the block’s owner. Repeating a card in the word does not give additional card points. Blue Square gets 0 card points for “s”. Red Circle gets 4 card points for “h”. Green Triangle gets 2 card points for “e”. Discard the blocked cards in the word. Cards without blocks are kept in the grid. The blocks go back to each player’s reserve. Any player can challenge your word before the blocked cards are discarded. The challenger looks up the word in the dictionary. Exclude abbreviations, acronyms, capitalized or usually capitalized words, and words with hyphens or other punctuation. If the word is invalid, you lose 5 points. You don’t get another chance to claim a word this turn. Leave the cards and blocks where they are, and finish your turn (optionally moving a block). If the word is valid, the challenger loses 5 points, and the game continues normally. The game is over when everyone has played all their cards. There’s no bonus or penalty for cards or blocks left on the playing area. Highest score wins. Ties do not get broken. It’s Blue Square’s turn. Blue Square has “k” and “f” in their hand. Blue Square doesn’t have many ways to claim words without using other people’s blocks. For example: claiming “sharers” would give Blue Square 7*5+0 points, but it would also give Red Triangle 7*5+2 points and Green Circle 7*5+4 points, so that’s a net loss. It might still be a good idea to use the opponent blocks, to remove them before the opponents can do something better with them, but Blue Square doesn’t like giving away points if it can be avoided. Blue Square sees another possibility, and plays “p” next to “s”. Now, Blue Square can claim “spars”, which is 5*4+0 points. Nobody else gets points for that, so it’s a net gain. The “s” and the block are removed. Now Blue Square has to decide where to put a block. The next player is Green Triangle, but the “e” doesn’t look like much of a threat. Adding “f” would allow “quaff” for 5*3+8 points. Adding “t” would allow “quart” for 5*4+8 points. To interfere with that, Blue Square puts a block on “a”, so that Red Circle can’t use the “qua-” without also giving points to Blue Square. Blue Square would still be down 8 points because of Red Circle’s “q”, but that’s still better than being down 28 points. Blue Square’s turn is over. It’s now Green Triangle’s turn. The standard deck has 20 cards with blue numbers and 20 cards with red numbers. In 2-player games, 12 of the red-number cards are randomly discarded. In this table, “a-0” is an “a” card with 0 points, etc. Note that there are 3 “a” cards, and each has a different point value.